Did I celebrate earth day? 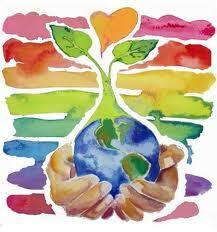 April 22nd is the earth day. The day observes the need to protect the environment… it was instated in 1970 to to promote ideas of ecology, encourage respect for life on earth and highlight growing concern over pollution of the soil and water. From 1962 – to 1970 almost an eight year gestation period for the movement. The 1962 bestseller by Rachel Garson called Silent spring triggered the movement, the Vietnam war, the 1969 Santa Barbara oil spill, the beetles the hippies all added momentum to this. But did I do anything yesterday to commemorate this? I attended no rally or seminar; I did not update my status or put in a blog. Caught will we realize we cannot eat money. We need to talk alternates, and children don’t listen they observe, see and follow. I created the compost bin one at our building garden and one for my balcony garden. We worked an earn while you learn program for young gardeners, it’s just that one bit. that what the real purpose of a creating days like, great to know.